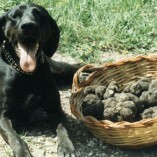 Truffle Hunt, inebriating experience | Tuscanyex | TUSCANY Experience - Excursions - Exploring - Expressions - Exclusive - Experts and so Exciting!! Spend an unforgettable half-day (min. 3 max 5 hours) guided by the fine nose of a trained dog and his hunter. An active and interesting experience suitable to families too, in direct contact with the natural environment, available almost all year round. This is the chance to discover the Tuscan devoted searching districts of San Giovanni d’Asso, Certaldo, San Gimignano, San Miniato and Montaione. We will learn about the types of woods and soil perfect habitat of each variety of seasonal truffle: the more precious white truffle we can search from late fall and early spring and the black truffle we can search in summertime. Following the dog, you will step on woody slopes that can be a little muddy, so you need to wear proper clothes and shoes, or if you are not equipped, we can lend you something suitable. After the search you can choose to taste the delicious scent and flavour of the super fresh truffles you found on top of different recipes, choosing to join a Truffle Brunch on a buffet, or a 4courses truffle lunch or a cooking class based on truffles. According to this final choise, the truffle hunt experiences will be different in length and fare, and can be on a private or sharing base.